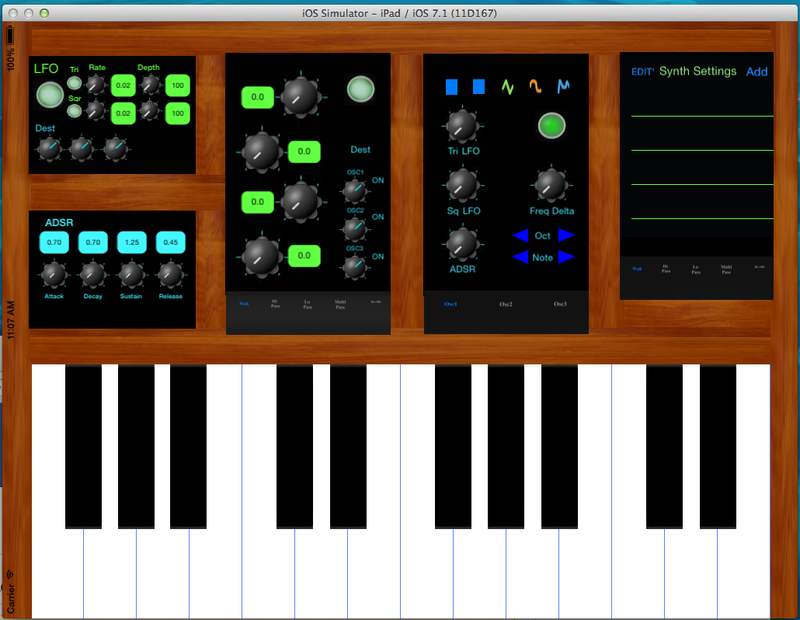 I’m finally working on the final ‘graphics’ for this virtual synth for the iPad. I used this space scene of some galaxies and just stretched them over the synth land, for now. It will be released in 1-2 weeks, more than likely. I’ve been working on and off for several weeks on the iPad synth and it has improved, measurably, since about two months ago. The initial release effort all comes down to this list of to-do’s (below). I’ve released an app for Doosan Portable Power (with a second one on the way), but it will be great to get something out that is purely my own. The other day I had to shutdown the Macbook Pro I was using and reboot. I really wondered what the heck was going on – I mean, this is a Mac. I then decided to mess with the synth app and starting looking at the memory monitor. The memory usage grew and grew, and then the old friend ‘memory leak’ came to mind. As it turns out, my app’s memory footprint would grow and grow based on some old, novice class retain statements I thought I needed at the time (this was 2011). Sure, the app worked, but it was far from efficient. It comes down to this: I did not quite have a good understanding of retain/init and release/retain. 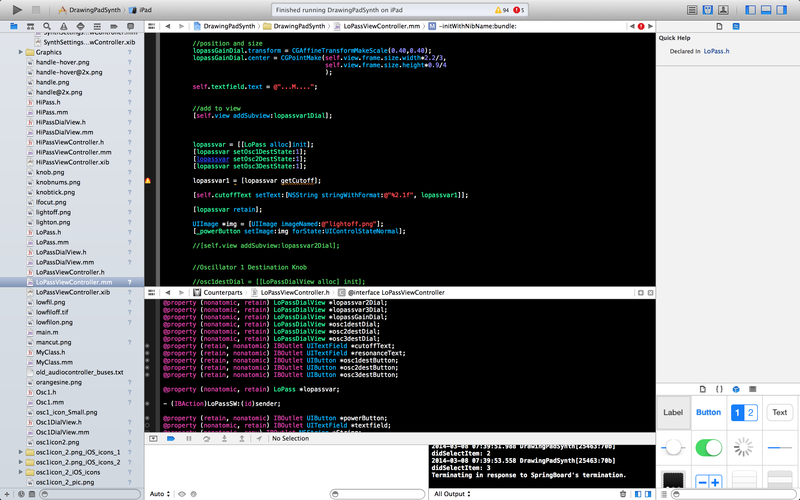 As it turns out, I am far better off leaving a class instance in memory than trying to init and release it. You see, in the case of this app, where I have made custom effects and filters, class instances get called in microsecond intervals. 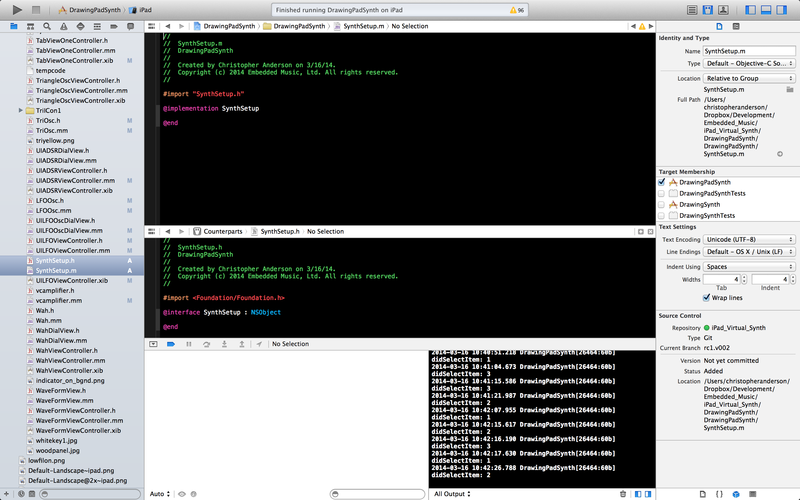 Each time a class is called, a new set of variables (and small buffering arrays) would pop into memory. Sure, separate instances are needed for various modules within the synth calling on, let’s say the LFO engine, but this LFO engine does not need multiple instances brought up during a “saw” oscillator “run-through”…. 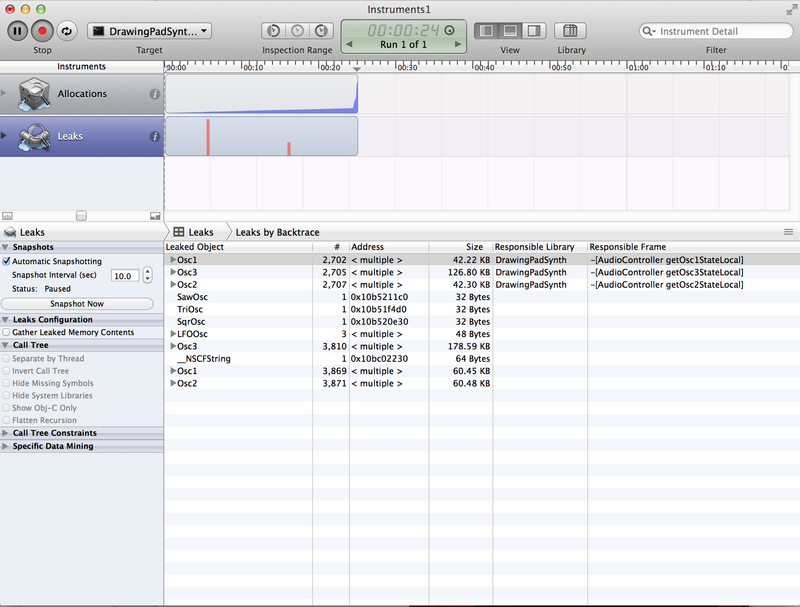 In any event, I started correcting things and the memory allocation seems to have stabled out at about 21MB. 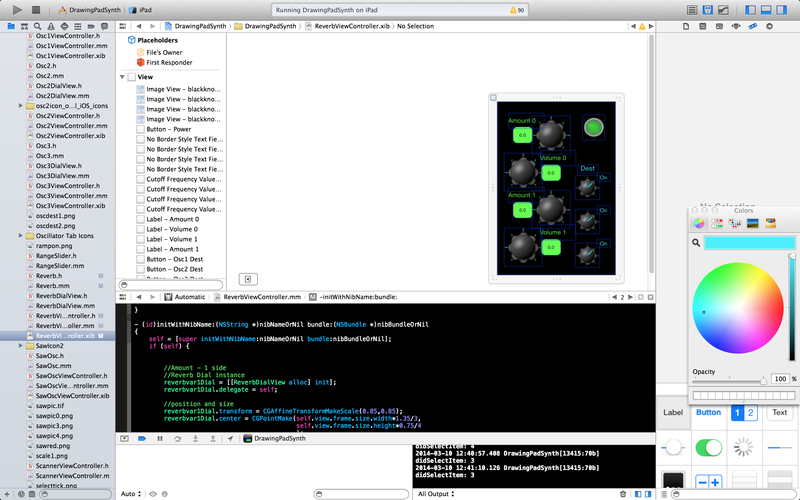 The Instruments application, a part of Xcode, was extremely useful. All done over lunch. I am now ready to proceed with developing a synthesizer setup system. 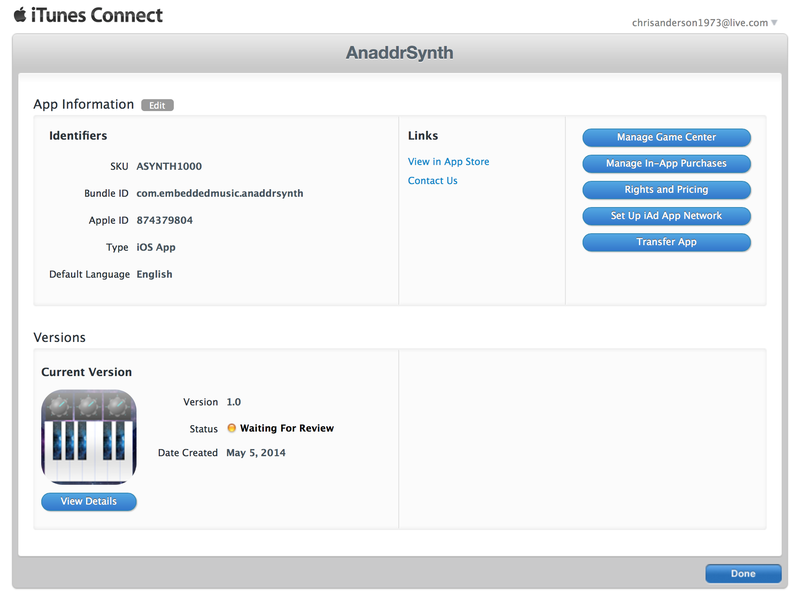 This system will be implemented as another Objective C class which may be accessed from an iCloud-connected file system and sub-UI within the synthesizer. The sub-UI needs sprucing up, but the iCloud accessibility was proven out months ago. After this is done, I then need to decide if I want to include the waveform customization (requiring a fourth or fifth oscillator engine choice) or make that an in-app purchase. We’ll see. 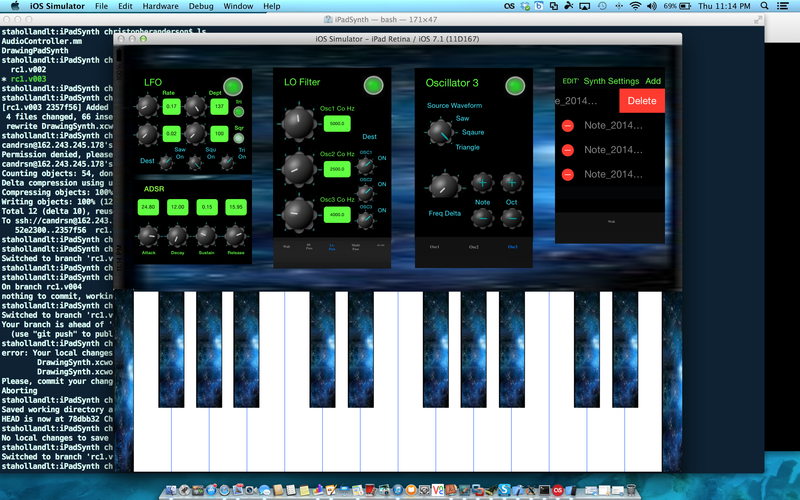 I’ve figured out how to further customize the sound of each oscillator (maximum of four) used in this iPad synth. So, work continues. Neat discovery/realization, though…..